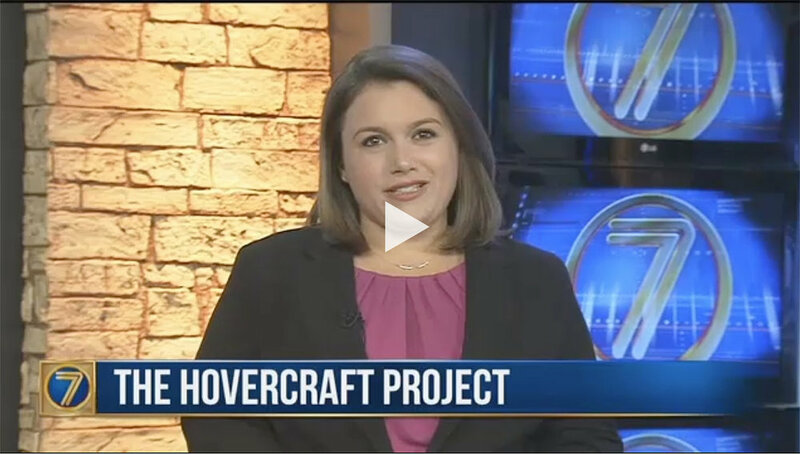 THE HOVERCRAFT PROJECT IN THE NEWS! NBC 12 Coverage of school visit. Heuvelton Students learn through hands on project. Pine Street Elementary’s cafeteria came alive Thursday as a make-shift hovercraft laboratory for the school’s fifth-graders. Think of it as a hands-on, quick-start project designed to drive home the kinds of science and math skills students will need to embrace in the 21st Century. With chairs and tables cleared away, students took battery-powered leaf blowers and combined them with a few household items to create mini-hovercrafts that they piloted back and forth across the floor. There was plenty of squeals and laughter from the youngsters as they wobbled the unstable crafts around the room, but there were also a few tears. Start your engines and that's exactly what some Lakeview Elementary School kids did Monday as they hovercraft raced. These 5th graders were all laughs and smiles as they raced against one another in the gymnasium at the Sarasota Baptist Church. Lakeview Elementary School says they received a generous donation from a family so the kids could construct the hovercrafts. Thanks to a serendipitous convergence of circumstances, Double Churches Elementary School students got an unusual hands-on lesson in the STEM subjects of science, technology, engineering and math — along with collaboration and communication — as they built hovercrafts and rode them across the gym floor Friday.